This morning the skies were blue and the mountains clear. Over morning coffee, the horizons were bounded only by mountains with snowy feet and bare crowns. By noon, the clouds had covered the sun. Here at the twilight of the day, the nearest mountains are nearly only memories, or abstract reminders as slightly darker parts of the undifferentiated horizon. At any moment now, the first of the flakes will begin to fall. Well over a foot will fall before these falling clouds rise again, having dropped the burdens of their great snow-hordes. The vaults of heaven will open and grant us a full share of winter. We are safe at the footsteps of a mighty cliff, overlooking the Greek-inspired Diana’s Bath and Echo Lake. We have nowhere we need to go in the time before the clouds lift – although if we’re feeling adventurous the best of snow will be available on Attitash & Wildcat. The snow shoes are in the car. The outdoor pool is steaming in the chill. We are fully stocked with books and snacks, and the lodge has a full restaurant (and bar). The role-playing games are in full swing. I often blog in my head while I’m doing physical labor. My very best blog post ever came from doing the laundry. Here are my deep thoughts from this morning’s dig out. Adam is laid low by the stomach bug that knocked me out. He’s no longer actively ill, but in the weak phase. Also, we don’t own a snowblower. Also also, I promised to take care of a neighbor’s house while they were gone. This means I’m like extra duper screwed, right? Wrong. I have the key to the neighbor’s snowblower (the folks who are gone have the best one on the block). I flagged over another neighbor to help me, and he spent two hours doing the snow blower work while I did the shoveling work at both houses. We’ll be potlucking at at yet another neighbors house tonight. Friends are awesome. I love friends. I haven’t seen my friends who live half a mile away in WAY TOO LONG. But neighbors who are friends are such a gift in blizzard conditions! 2. What would it take to actually make our little New England civilization stop working? A la Hurricane Sandy, at what point does our society cease to function? Or does it shut down in dribs and drabs? Already there are plans for some Boston streets to be one way until April 1st. At what point does normal life stop? Are we already there? March is supposed to be colder than normal. The 10 day forecast only gets above freezing once (35 degrees). There are two more precipitation events in that forecast, adding up to 5 – 10 inches of snow. I don’t know when life will go back to normal, but six weeks seems like a good guess. It will probably be a lot longer until you can no longer find snow anywhere. A common thought as I shovel snow is that winter is a crappy time to be a feminist. See, I’m physically perfectly capable of shoveling snow. I don’t believe in a gendered division of labor. Do you see where this is going? What it means is that I, as a feminist, can’t tell my husband that snow is his job because he’s a man. This is a crying shame on days like this. I’m guessing that our old roof wouldn’t have held up to this. Lots of people have lots of leaks. Our pitched roof is dropping the snow all by itself, no problem. The insulation looks great too, as the only melting is sun melt on the Southern exposure. This is all sun melt. 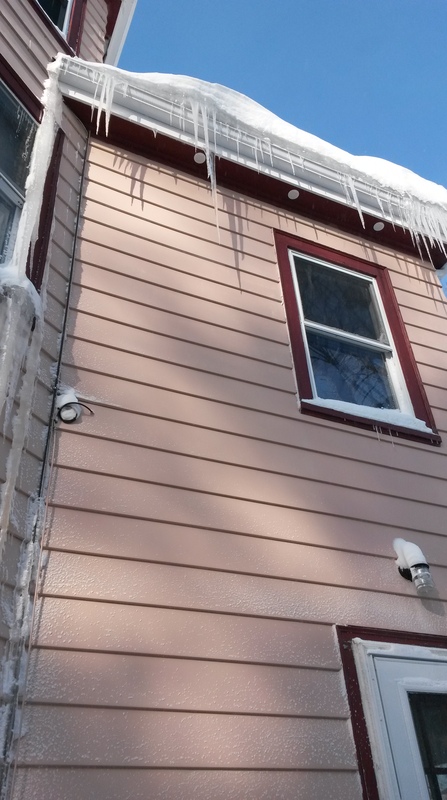 Our roof has many fewer icicles than most of our neighbors. 6. I blow dried my hair this morning. I almost never do that. The few times I’ve tried it was to make my hair look good, a goal that I’ve never really been successful in accomplishing. It looked great this morning. Then I pulled a wool hat on top of it. The point was that going out in 13 degree weather with a high wind warning for two hours of shoveling with a wet head. I should try less hard, and maybe the whole hair drying thing will work. Tuesday? Tuesday only? Will there be parking when I get to Fort Point? What’s the best combination of not spending stupid time on the road and stupid money on parking, while still spending time with my colleagues. I can’t work from home until April 1st, and might go insane if I tried. They’ve never played this many video games in their life. I’ve lost all will to parent. Judging by how many of their friends are online, making Minecraft traps with them, I’m not alone. 9. But at least they won’t miss school? That’s the upside of this all happening over Feb break week, right? No chance of snow days this week, nuh uh! And hopefully by the time next week rolls around, we’re now longer in the icy clutches of Snowmageddon. (10 day forecast says it snows 5 – 8 inches Sunday night. I hate you 10 day forecast!) I feel really badly for the teachers whose success is judged by the standardized tests these children will be taking in a few weeks. They’ve missed so much instructional time, and I have to say that I think my kids study skills and core skills have backslid in the last three weeks. Totally not fair to their excellent teachers! Our front walk way has a fault line. Considering teaching the children avalanche safety. I’ve gotten plenty of comments from Northwesterners who point out that Boston currently has more snow than Snoqualmie Pass. The entire US is suffering from a changing climate. (BTW – any time we want to collectively start acting on this problem is good for me. Count me in.) But given a choice between extra violent winters, extra precipitation and more extreme weather, and drought and loss of ground water… I’ll take the nasty blizzards. The entire West is going to bake this summer, with no snowpack to feed the rivers. Florida is losing it’s potable ground water. We may live in Snowmageddon country, and this may be our new normal, but at least we have water. The spring will come. There was a year in medieval history when summer never came. That’s not our situation. They may be delayed, but we’ll have snowdrops and crocuses and lilacs and camping trips this summer. We’ll look back on this as an epic memory, but we will some day see grass again! Well, my fellow New Englanders, I did my best. I figured writing about the impending snow storm would make it, in the spirit of New England storms, become a non-event. Last night, as the hour for its arrival passed with a few errant snowflakes, I hoped. It was not to be. 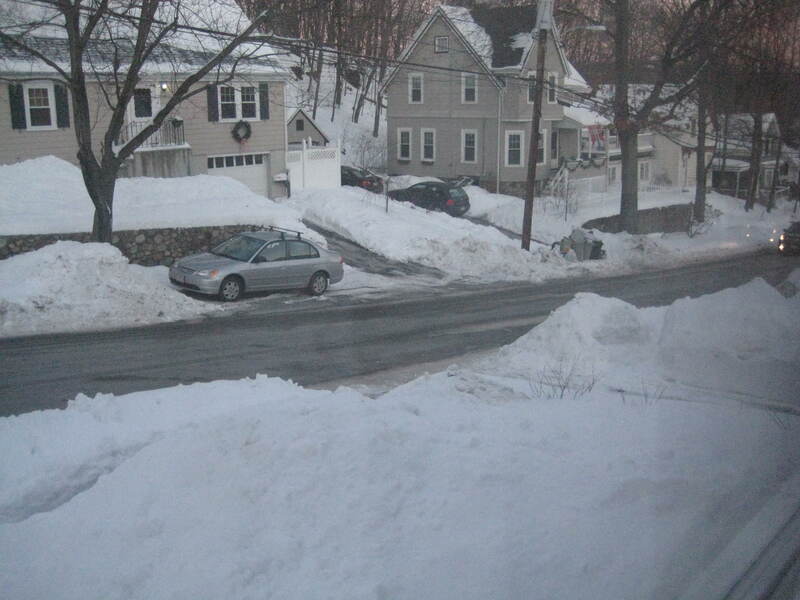 Now, I try really hard not to complain about snow in New England in winter. (Or 100 degrees with 90% humidity in summer.) At least, no more than the standard complaints. But really. This is unacceptable. My husband I each put over two hours in shovelling our driveway out again. 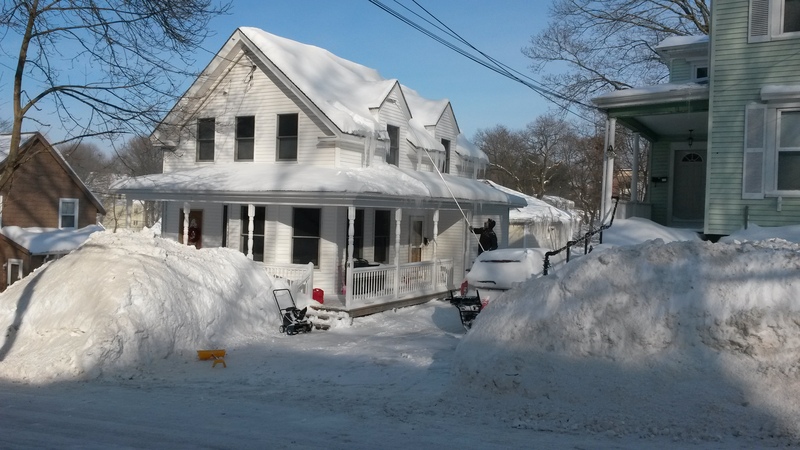 We had to carry snow across the street from the first shovelsful. It would’ve been a significant snowfall if it was the first of the year — maybe a little over a foot. But coming on top of existing berms, it was brutal. And you know, I consider that in the modern life, there are very tasks jobs where my gender matters. Hardly any really. 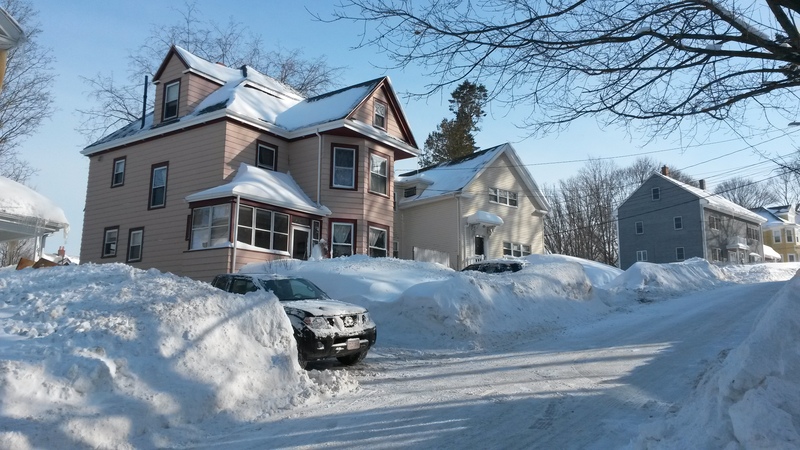 But when the snow piles are 5 feet high, it turns out upper body strength is at a premium. I simply could not get the snow high enough for most of the locations, so I had to walk a long, long way carrying heavy snow to clear it. I did, however, sneak in 5 minutes of pictures to show just how bad it was today. I was hoping to get all artistic and try out camera settings etc, but there was just Too. Much. Snow. As it was, I made it to work at the crack of 11 this morning. The only saving grace was that everyone else has to deal with the same snow. Also, Grey has been successfully signed up for Kindergarten. It was rather anticlimactic. The woman at the front desk seemed very surprised that I’d actually read the web site, filled out the appropriate paperwork and had the needed documents already copied. Hopefully she favorably remembers me forever from now. Or at least for the, er, 7 years she and I will be BFFs. Perry the Platypus wears a hat. Date night. I won this round on behalf of the Allies. This is the capability that made me really want a new camera. You can't do this with a point-and-shoot. At least not mine. We played a game called Arimaa. My husband won. Then he spent a week reading up on strategy. I love this chess set. It's so hard to take pictures of lots of snow. Where would you put this snow? Snow shoveling is a neighborhood activity. We were all out today, and the kids played while we shoveled. Where we do put the snow. Those are stairs, if you can't tell. You might have heard that it’s been a wee bit cool in New England this year so far. Sometimes I’m a little slow to get going in the mornings. This morning I noticed that the “Min” 24 hour temperature was higher than the current, and the “Max” 24 hour temperature was lower. Huh? That’s totally backwards? Then I noticed the little “minus” sign. GOOD GRIEF we have a lot of snow. And in our old New England neighborhood there is NO WHERE to put it. The last snow storm I was reduced to moving shovels-ful across the street, or walking half a mile with a loaded shovel to a narrow strip of of cleared space to dump it into my back yard. (OK ok… maybe only a quarter mile but after your first bajillion trips it gets tiring.) 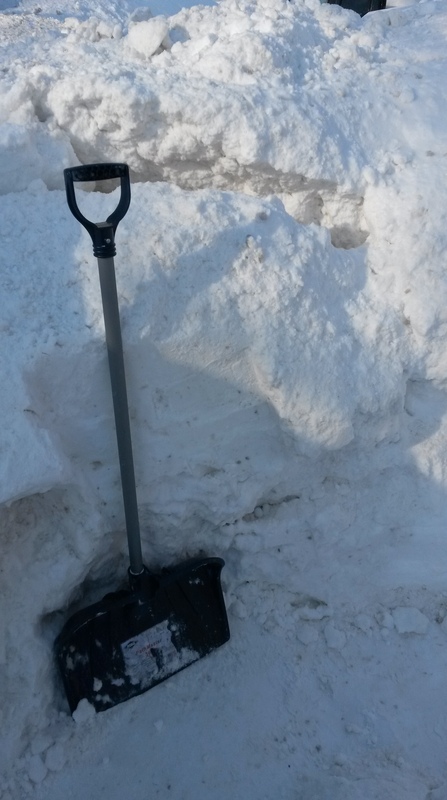 All the places we normally shovel our snow to are piled not only above my head, but above my flagging arm strength. 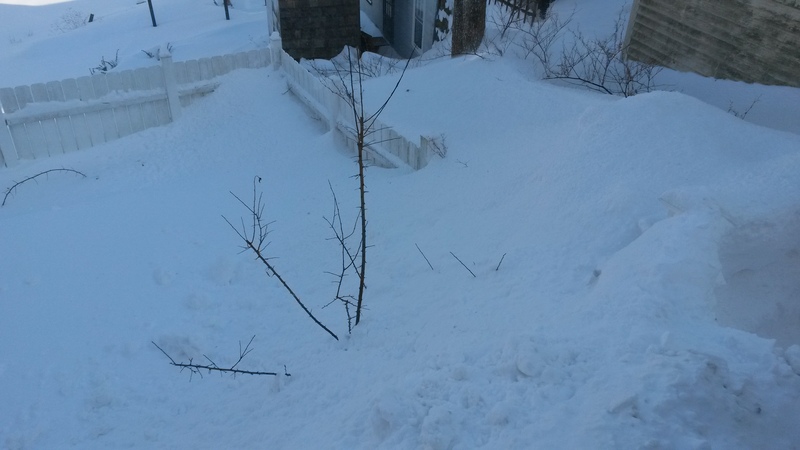 I have become fearful of the avalanche danger inherent in walking out my front door. The only consolation is this: we were sufficiently New Englanders to prepare for it. See, the first few years I lived here I figured if I didn’t shovel, well, big deal. It would just melt tomorrow or the day after anyway. This is true, by the way, for the West Coast. Even at my homestead’s 2000 feet of elevation, it was a rare snowfall that lingered in shade for more than a week. So back in the old days (pre-kid) we might get 6 inches of snow in late December and I’d do a partial job, or I’d ignore it, or plan on “doing it later”. I can hear my fellow New Englanders chortling in Shadenfruede at the inevitable outcome of that decision. I mean, maybe… MAYBE there will be a warm snap in December that will, like grace, wipe away your snow-sin. But the more LIKELY outcome is that those slushy footprints of snow will become as hard and calcified as dinosaur footprints. The partial pathway where you dragged one shovel’s length of clarity will be the only path you can possibly walk for the next 3 months. As you hit berms of unhandled snow for the next several infinities of winter, you will curse your previous profligacy. After a few winters, you get the idea. You tackle December and January snows as though any flake on the ground after 24 hours will be a permanent addition to your home — a lasting testament to your good character and ability to exit the house. This year, however, Christmas threw us a curveball. As we luxuriated in the 5 star accommodations that my mother-in-law provides, a good 18 inches of snow was falling, untended, on our driveway. A late December snow. Untackled. My kind neighbors dug out our walk. (Quoth one, “Wow, you really don’t have anywhere to put the snow, do you?”) The driveway, however, was the kind of Arctic wasteland that might cause sled-teams to despair. And two weeks ago the forecast was for a snowpocalypse (rightly, as it turned out). So we set about to right our wrongs. We went to Rounds Hardware, bought 50 pounds of rock-salt, another shovel and an industrial-strength ice-breaker. My husband and I spent an entire Saturday naptime chipping away at softened snow and walking it three miles out to the back yard to dump it. By the time our kids woke up, our driveway was bare and dry. And then we got two feet of snow. We were, my friends, justified by our work. I think of that, as I equip my children with long poles and whistles on their way out the front door. We may be suffering, but at least it wasn’t for our stupidity. And even if we get the horrifying predictions of a foot or two of snow, at least there’s a clear path to the glacier in the back yard. In an ironic twist of fate, I was called upon to temporarily abandon my blogging (which, seriously, if this blog gets any more abandoned it may start crying itself to sleep at nights) in order to fix a frozen water pipe. 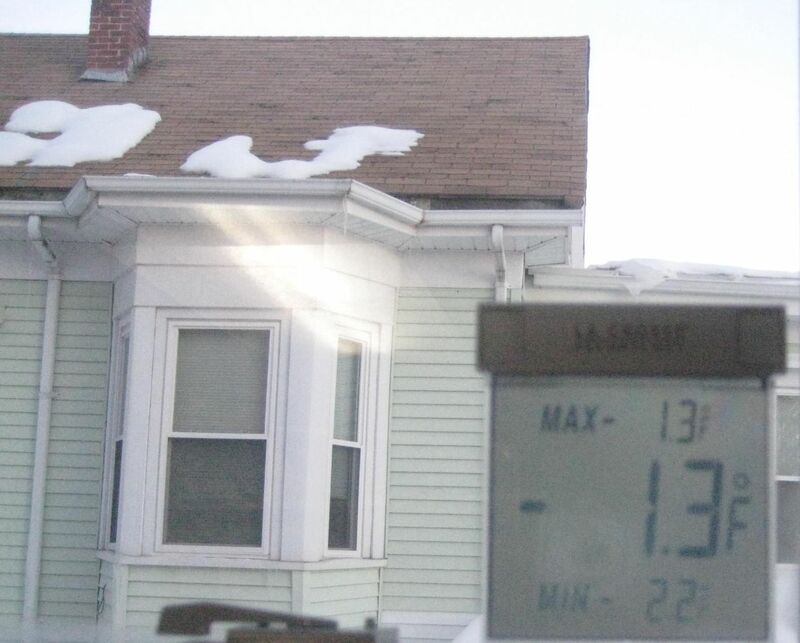 Apparently -2 degree weather can freeze pipes inside your heated home! Fun fact! All I have to say is: hair dryers. Your best friend for insulation AND plumbing work!